Let me start by saying that I do not retell these penitentiary stories often. That was a very rough stage in my life that, through the grace of Allah, I was able to overcome. For those of you who have not heard my story on how I became incarcerated and what led me to accept Shia Islam, I would ask you to please watch the documentary about my life titled Journey of the Spirit filmed by Anwar al-Hussain TV in 2011. I was asked to tell about my experience by someone who is doing a documentary about life as a Shia Muslim inside U.S. Prisons. They asked me to elaborate on the situation of the Muslims in Prison, sectarian tensions, sectarian violence, and obstacles that Shia face in prison, etc. This is the purpose of me writing this article. I do not wish to promote hatred or further sectarian strife, but only to recap my interactions with people from the Sunni, Salafi and Wahhabi sects. I will tell a few of the instances that come to my mind and try to paint a picture of what the situation is. I was incarcerated for 9 years in South Carolina prisons. I can only speak for what happens there, although I have been receiving letters to an organization I work with that serves prisoners eager to learn more about Islam, 2nd Chance Books, from prisoners around the country saying they are suffering similar trials and tribulations. In the majority of the prisons there are usually large Muslim congregations. The majority of these Muslims are from either the Sunni, Wahhabi, or Salafi sects. However, they all call themselves Sunni Muslims, but they say they follow the “Salaf-us-Saliheen” (righteous predecessors) and they study from the books of Muhammad ibn Abdul Wahhab, the founder of the Wahhabi sect, and Ibn Tamiyyah who promoted hatred and violence towards those who did not subscribe to his views. Throughout this article I will refer to them as Sunnis, due to the fact this is the term that they used for themselves. As for Shia Muslims there are usually a handful of people who converted to Shia Islam in each prison. They convert after reading and studying books about Ahl-ul-Bayt (AS) that made their way into the prison system through different organizations in the USA and Iran. The reason that there are so many Sunnis, Wahhabis, and Salafis in prison is because the majority of the Muslim Chaplains subscribe to one of those schools of thought. Also, they receive numerous free books from Saudi Arabia that they disburse throughout the prisons for free. They try to control the masses by telling them only what they want them to hear and pushing their own ideology and agenda. They send in books by Muhammad ibn Abdul Wahhab, Ibn Tamiyya and even go as far as disbursing books like the one titled “Demolishing the Creed of the Shia” and other books that call Shia Muslims disbelievers, insult our Imams (as) and provoke aggression. The Shia Muslims are the minority and are oppressed by others for being so. The main point they criticize the Shia for is that the Shias’ adhan (call to prayers) and salat (prayer) are different than theirs. They also do not agree with the Shias following the Imams of Ahl-ul-Bayt (AS), the belief in infallibility and do not agree with the Shia for criticizing and scrutinizing some of the sahaba (companions of the Prophet). From my own experience the only way that they would leave you alone was if you could prove your beliefs and actions through books. This is why it was vital for every Shia Muslim to be well equipped with the knowledge to defend his faith. It is reported that the Prophet (SAWA) said, “One learnt Muslim is harder on the Shaytan than 1,000 ignorant worshippers.” If you could show them the source for your point of view, then they would leave you alone and let you practice, despite how upset and frustrated it made them. They would then ostracize you and tell all the rest of the community to avoid you, not to talk to you and most importantly not to accept words, advice, or literature from you. Even before the new Muslim knew how to pray they would be told whom to stay away from. When I became a Muslim in 1999 the majority of the Muslims were Shia and the administration tried to break up our community. They sent many Sunni ulema (scholars) from the mosques around America into our prison to try to “correct our deviant beliefs.” Every time they tried to come and debate us we would defeat them through our knowledge and good akhlaq (ethics and behavior). Eventually they thought the solution would be to separate all of the most learned in the community. They thought if they could separate the head from the body that it would destroy the community. So, they relocated us to different prisons throughout the state. Little did they know, instead of killing the Shia belief in the prisons they actually spread it. At all of the prisons we went to we became teachers and educated whole communities of Muslims and taught the teachings of the Ahl-ul-Bayt (AS) to everyone we came in contact with. I would like to discuss a few instances of oppression from my personal experiences inside the prison system as a Shia Muslim. After they started breaking up our community and they shipped our community leader to a different prison, the Sunni inmates took over and put one of their people in position as head of the community. The first Jum’ah (Friday) sermon he delivered was one and a half hours on describing the sins, faults and errors of the Prophet Muhammad (SAWA). (May Allah save us from their lies!) I couldn’t take it anymore. After all, my favorite sahaba (companion) was Abu Zar al-Ghifarri who stood up during the prophet’s time to publicly declare his belief in Allah despite the harsh oppression the Muslims were under. The idolaters beat him and he got up and did it again and this happened three times before the uncle of the prophet Abbas intervened. Also he is the one who defended the rightful position of Imam Ali (AS) as the successor to the Prophet (SAWA), after the three unjust Caliphs took his position by force. Abu Zar used to stand in front of the palace of Uthman and Muawiya and would publicly recite those verses from the Quran that cursed the oppressors. This eventually led to his exile and also his martyrdom. So back to the situation at hand, I stood up and started saying to the whole congregation that this man who spent over an hour slandering our beloved prophet (SAWA) was wrong and I refuted all his claims from Quran and ahadith. They got really upset with me and got prison security to make us all leave. A few days later at the afternoon salat, the Chaplain had got word from the Salafi inmate that was running the prison community that we Shia were causing trouble. The Chaplain invited a Hafez of Quran (a person who has memorized the whole Quran) from Somalia. The Hafez said that he would like to debate us Shia, but would only debate one who knew the entire 12 Imams by name. Unfortunately not many of the Shia knew all of the names sequentially, but I at 18 years old stood up, named all of the Imams (AS) and gladly accepted the challenge. He said that Shia was a word that was not mentioned in the Quran at all, but rather a term and religion that came many years after the Prophet (SAWA). I asked the man if he was indeed a Hafez of Quran, which he replied in the affirmative. I then proceeded to tell him about the ayat in Quran where Allah says “And most surely, Abraham was among the Shia of him (Noah)” (Quran 37:83) and “And he (Moses) went into the city at a time when people (of the city) were not watching, so he found therein two men fighting, one being of his shia and the other being his enemy, and the one who was of his shia cried out to him for help against the one who was of his enemy” (Quran 28:15). I asked him to confirm if these were both in the Quran or not. He had to answer yes and admit that Allah called the followers of His prophets Shia. The Chaplain started making commotion and said the time for Salat had come in and started to call the adhan to end the humiliation of the scholar he brought to debate us. The next day following this debate I was returning to congregational salat when my close friend told me that some non-Shias in his dorm had planned to stab me and another brother, who was my teacher, while we were praying our salat-uz-zuhr. He had heard from someone else that was not in agreement with the plot. So when we went to pray, my close friend, who is also Shia, stood back and didn’t pray congregation. He was concealing a knife as well and was going to stop anyone who tried to hurt us. They tried to get him to pray with us, but he told them that he had already prayed in the dorm and thus the plan was foiled. The day after that, they shipped me to a different prison and upon arriving to that prison the community made me their minister of education where I taught Islamic studies classes for the next year. I am glad to say that I am still in touch with this brother who was willing to risk his life for me. He is currently serving a life sentence and since my release I have been equipping him with all the necessary materials he needs to help him and the Shia community. Another instance was in my last year of incarceration I happened to run into a guy that was my roommate 8 years prior. I taught him about Islam and actually taught him how to perform his prayer. Like I said earlier, I got shipped away shortly after that incident and the guy remained there and ended up learning all of his religion from the non-Shias that were now running that community. So now this guy was brainwashed by them and when we started to pray he got furious at me and said I was doing it all wrong. Of course I proved all of the Shia practices for him from the books that I had in my possession. Him and his goons said that we were not allowed to pray with them in the shared prayer room that we had in the dorm, unless we prayed the exact way they did with our arms folded, saying ameen after Surah Fatiha, etc. This was my last year and I was very close to going home so I didn’t want to preoccupy myself with this sectarian drama. I told the other Shia brothers in the dorm that we will just pray at a different time than they did, for example, slightly later because our Maghrib comes in at a later time. So we continued to pray in the prayer room at a different time than they did. This was not enough for them, so they said if we continued to use the room there would be consequences. I am not one to be pushed around and we had every right to use the room. I went into the room at prayer time and called the adhan loudly and said “Ashhadu anna Aliyan waliyullah” proudly as loud as my voice would allow. When I finished calling the adhan I turned around and the guy was in the prayer room waiting on me to finish. He was telling me to leave and I refused so he pulled a knife on me, but thank God my friend and fellow Shia brother came rushing in the room and said that if anyone wanted to hurt me he would have to go through him first and had a big knife in his hand. The guy got scared because he saw my friend was serious and he left the room. He went and rounded up the others and came back to try and team up on us. By this time it escalated into more than just Muslims. The people from our hometowns got involved and it was going to turn into a riot. Nobody wanted that to happen so when it came down to it both sides that rose up to fight called him and me into a room and wanted to see the real issue. I explained what happened and then the people from his hometown did not want to fight us over some religious dispute and convinced him to leave it alone, to which he agreed. 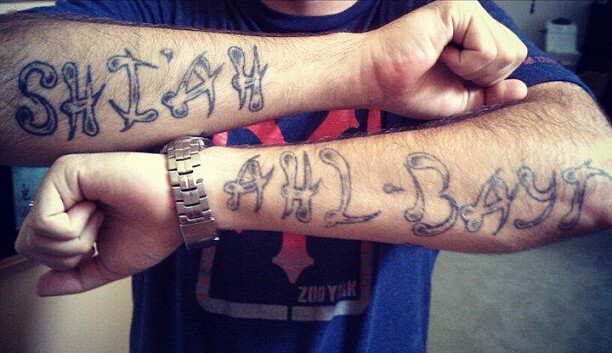 I was tired of these people trying to convert me to their violent version of the religion by force and I went and got the words tattooed on my arms Shia on one arm and Ahl-ul-Bayt on the other to show them that I would always be a Shia. They finally left me alone and considered me a lost cause for converting. About a month later I was sent to a pre-release center to prepare for my entrance back into society. All of this violence and harsh behavior came from ignorance and lack of the true teachings of Islam taught to us by our beloved Prophet (SAWA) and his Family (AS). Saudi Arabia has used their wealth to print thousands of books and distribute them freely to prisons across the world. We as Shia need to step up to the plate and get these brothers the correct information about the Ahl-ul-Bayt (AS). It is our duty to help them and show them the correct way, the way of tolerance and peace. They can learn so much from the ethics and morality of the family of the Prophet that they could change their lives and become outstanding citizens. This is why some like-minded brothers and I started an organization titled 2nd Chance Books, which Ahl ul Bayt TV filmed a documentary about entitled Faith Behind Bars. This program will provide the proper tools for change: Free Islamic books on belief, ethics, morality and family structure in Islam. They can use these books as a tool for self-development and to reform themselves and also their friends, loved ones, and communities upon their release. Some of the many benefits of this program are the changing of prisoners’ bad habits into good ones, achieving social reform by teaching the morals and ethics of the Holy Prophet and his Holy Household (AS), molding leaders, producing better citizens who will be active in helping their communities upon their release, promoting awareness of the true teachings of Islam as taught by Prophet Muhammad (SAWA) and his Holy Household (AS) and removing misinformation and misconceptions about Islam and Muslims from people’s minds. This program is funded by donations to our publishing company, Yasin Publications. A donation of $25 is used to sponsor sending a prisoner a package of up to six books. We ask everyone if they are able to please visit http://www.2ndchancebooks.org to contribute and give the gift of knowledge to a person that could change their life and possibly the lives of everyone they interact with. I hope and pray that this information was beneficial to the reader and that you gained a better perception about the struggles our brothers in prison go through on a day-to-day basis. May Allah grant them knowledge, guidance and protection from the oppressors. Please keep the prisoners, the forgotten believers of our community, in your prayers.